Improving manufacturing efficiency demands constant action - from uncovering operational waste to identifying areas for continuous improvement. Namely, we must always pursue a cycle of visualizing, analyzing, and solving energy saving challenges. These challenges range from turning off lights and saving energy in individually powered equipment such as boilers, pumps, and compressors, to energy management of overall factories and companies (FEMS*). And for the future, our regional efforts play a role in achieving a society that continues to engage in energy saving measures. One of an energy saving plan is to understand the current situation. By measuring energy and visualizing it in graphs and reports, we can identify waste and discuss savings targets. 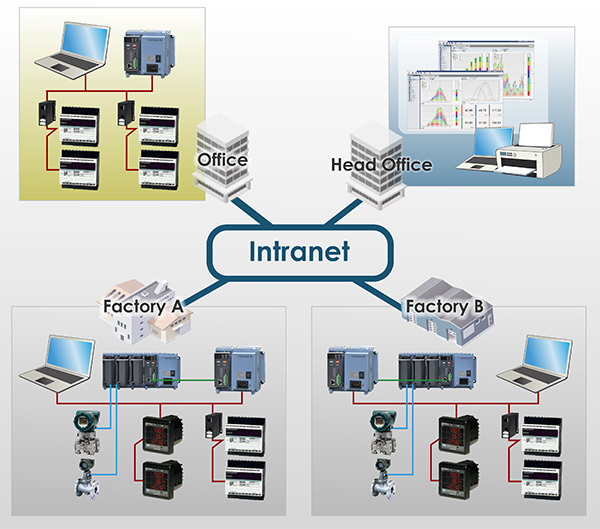 At plants with diverse energy sources, it is difficult to fully ascertain usage conditions. In addition to power, we must measure air conditioning, steam flow, and other quantities to understand the comprehensive consumption patterns from the offices to the factories. We can also look at energy consumption as it relates to the in-service conditions at the factories. While energy is needed to make things, it's not uncommon to discover energy overuse due to the tendency to emphasize quality and ease of manufacture. To continuously work toward energy savings, it is urgent that we visualize energy usage. Energy monitoring systems that use Yokogawa data loggers (SMARTDAC+) and power monitors record higher-quality data, and are less susceptible to attacks from viruses. By adding an AI module to SMARTDAC+, you can acquire temperature data from air conditioners and other equipment, and by adding a DI module you can visualize quantities of steam from flow measurements. Then, you can synchronize this to power consumption and easily analyze various types of energy. Plus, SMARTDAC+ lets you view your acquired data from a mobile device such as a tablet without the need for any extra monitors or accessories. 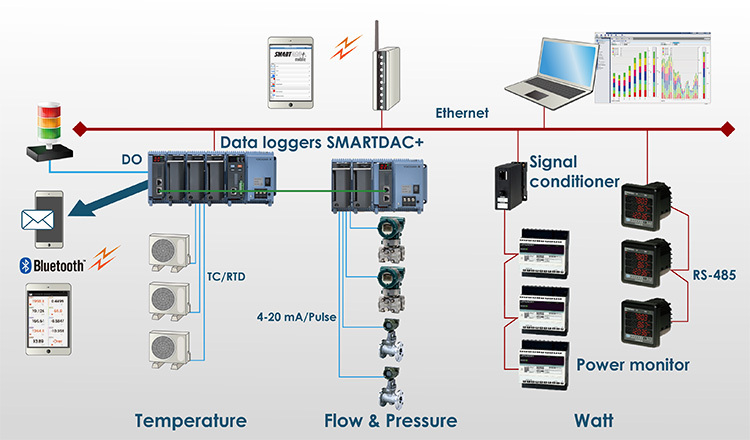 SMARTDAC+ Data loggers are helping our customers quantitatively assess and analyze energy usage conditions resulting from continuous improvements, and thereby implement effective energy saving measures. *Please note that SMARTDAC+ requires special firmware for energy monitoring. Please contact us for the details. 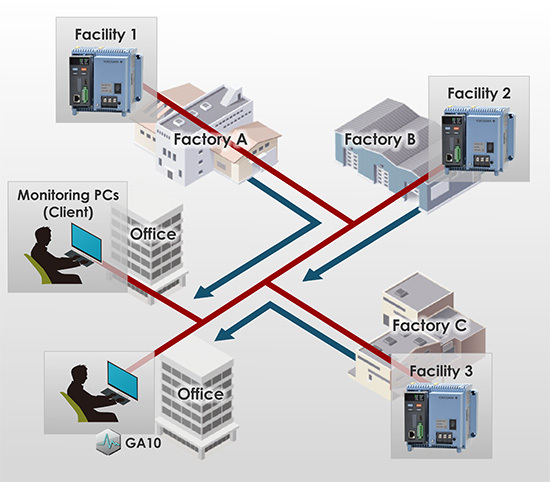 For industrial and lab applications, the GM10 offers Bluetooth wireless connection and modular I/O that offers accurate and reliable measurements. 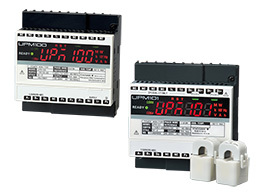 UPM100 / UPM101 is a compact power monitor that can measure 15 items such as electricity energy with 1 unit.